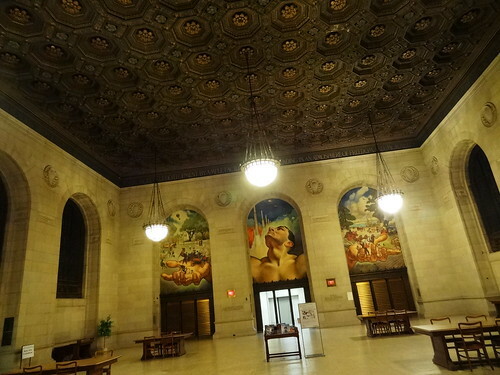 Detroit is extremely fortunate that many of its outstanding 20th Century buildings still exist; the Detroit Public Library on Woodward is one such place. 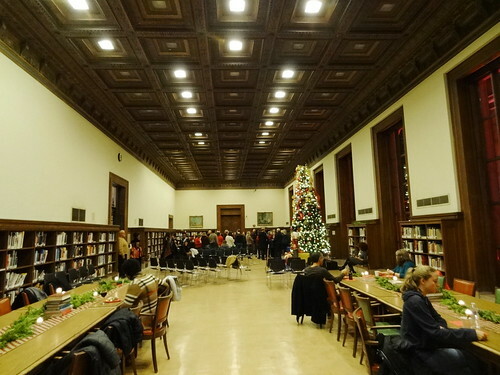 In 1912 Cass Gilbert was commissioned to construct the building; WWI and other delays slowed the completion, finally, in 1921 the amazing Italian Renaissance library opened its doors. 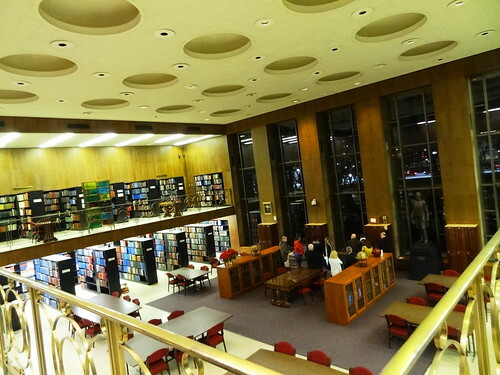 This is the 4th largest library in the United States, it welcomes 222,000 visitors a year. The large room is an eclectic mix of old and new, funky lighting hangs from the ceiling, benches are upholstered in olive-green, cinnamon and navy. 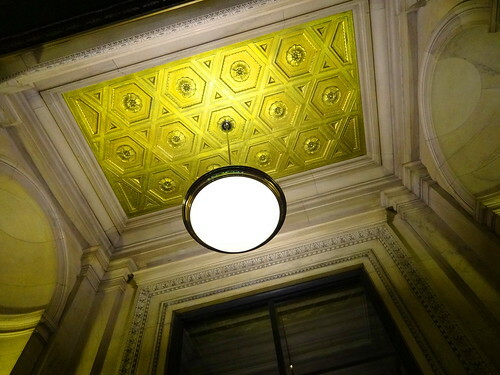 Original architectural elements have held their ground for over 150 years. 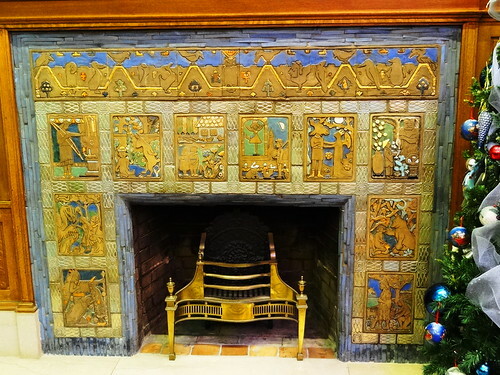 Our guide points out the Pewabic Tile fireplace surround; done in shades of blue, tan, yellow and gold it depicts scenes from favorite childhood stories, it’s gorgeous. Above it a pictoral map of Michigan by Frederick Wiley shows the arrival of the French to the wilderness of the territory. 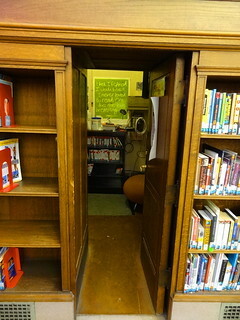 I never noticed the little door hidden in the bookshelves, we get a peek inside the secret room. 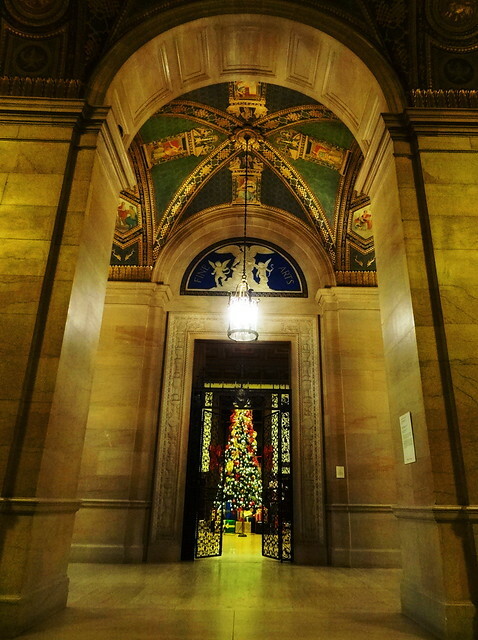 In the hall, I’m once again reminded of how much I love this building. 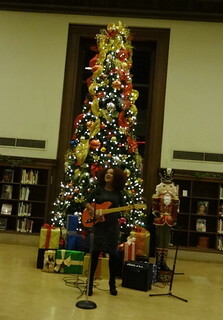 Tonight between the holiday lighting and the darkness beyond the windows it looks extraordinary. Walking from the original building to the 1963 addition we find ourselves surrounded by mid-century design. The transition between old and new is thoughtful and seamless. 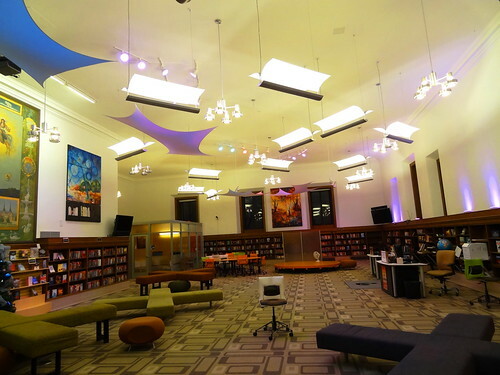 We enter the new Children’s Library, here stuffed animals, picture books and rhyming stories entertain youngsters; be sure to check out the mosaics hanging on the wall, kids from Detroit Public schools had a hand in making them. 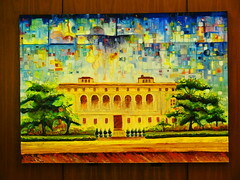 The library is also an art museum of sorts, beautiful art can be found everywhere and it’s all out in the open. 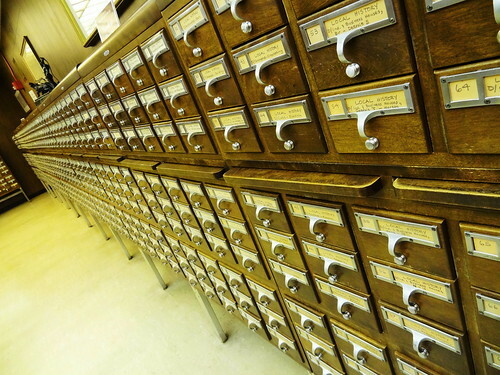 The hall leading to the Burton Historical Collection is lined with rows and rows of card catalogs, they’re over 100 years old and span the history of Michigan and Detroit from the 1700’s to the present– there’s no plan to modernize or get rid of them, some things should stay the same. The 2-story room that holds the collection is very 1960’s in style, the tall narrow windows allow natural daylight to saturate the space. 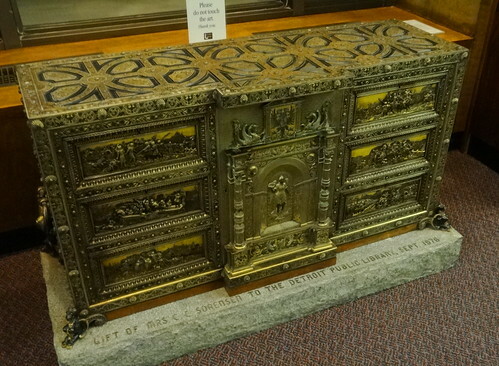 One of the highlights is Stalin’s Gift, a lovely jewel chest commissioned for the Russian Royal Family in 1883. Joseph Stalin gave it to Charles Sorensen of Ford Motor Company for Sorensen’s help establishing Russian auto plants during WWII; his widow donated it to the library. We’re on the move again, we pause at Frank Varga’s mosaic of Nicolaus Copernicus, a Polish mathematician and astronomer, it was donated to the library in 1974. The Friends Foundation used tour proceeds to purchase the spotlight that illuminates it tonight. 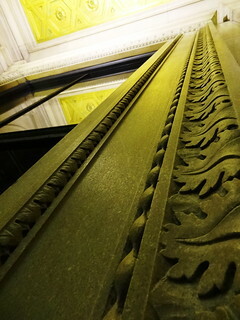 The Grand Staircase is made entirely of marble, it’s exquisite, as we ascend the stairs we get glimpses of the spectacular Italian Renaissance ceiling. 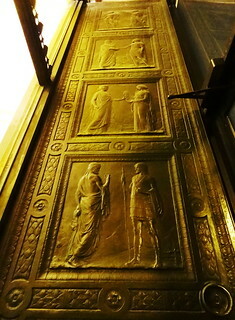 Throughout the building you will find gold leaf, symbols, figures, Greek and Roman motifs and themes of books, knowledge and wisdom. 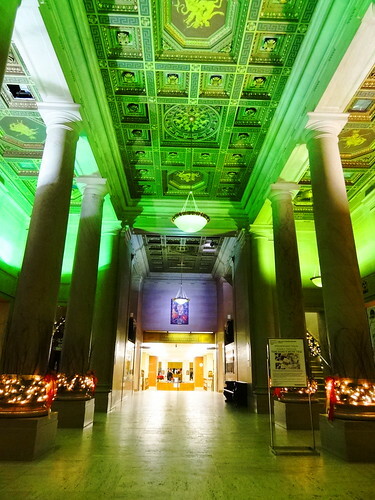 Every room on the 3rd floor features a ceiling designed by Frederick Wiley, most are reproductions of ones found in European palaces, all are stunning. 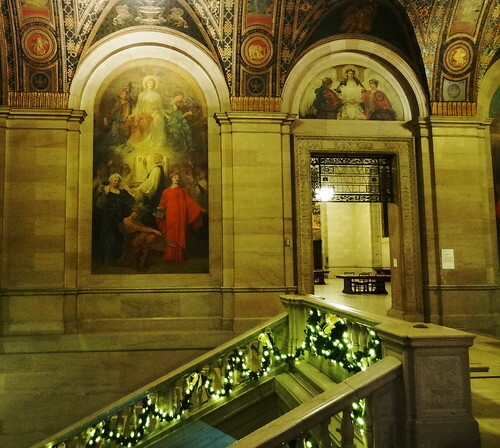 The 3rd floor is my favorite, the view of the ceilings and murals is fantastic; then there’s Adam Strohm Hall… Adam Strohm was the first library director to work in the building, there’s so much beauty in one place it’s mind-blowing. 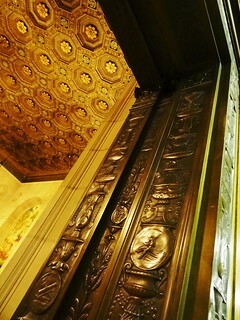 Check out the bronze entrances around the doors before you step in. Immediately our attention is directed to John Stephens Coppin’s “Man’s Mobility”, the painting features three era’s of transportation from horse and buggy to rocket ships. 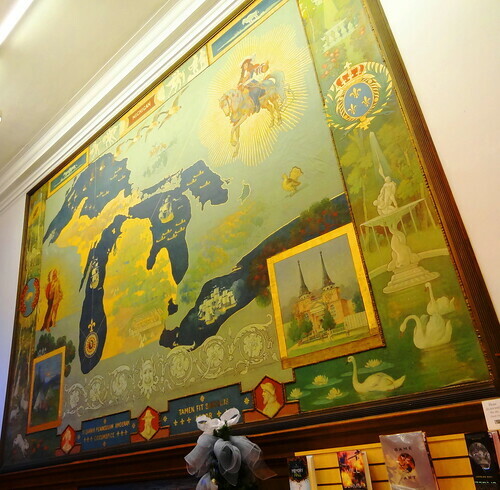 The mural on the opposite wall is Detroit’s early history by Gary Melchers. 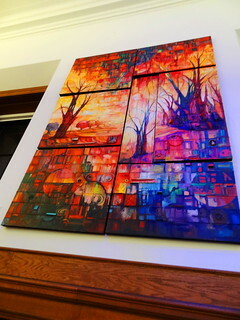 The windows you see are not stained glass but painted, the idea was stained glass was too dark, painted windows would let in more light for reading. 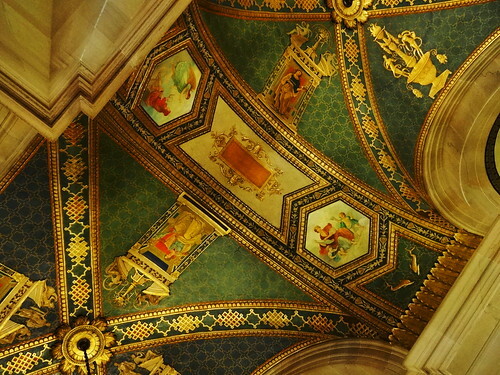 Then there’s the ceiling, I’d like to just lay on the floor and stare at it for a while, take in the whole room…The ceiling in the Art and Music room was a new design, it’s very simple compared to the others; Cass Gilbert liked it so much he used it again in the US Supreme Court Building. The tour ends in the Fine Arts Room, another gorgeous space. 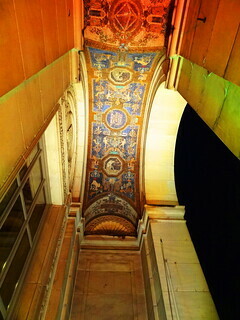 Tonight we’re in for a special treat, they have opened a window and allowed us access to the loggia. There are 7 mosaics underneath the loggia windows, each depicts quotes from Shakespeare’s “Seven Ages of Man” monologue from As You Like It. 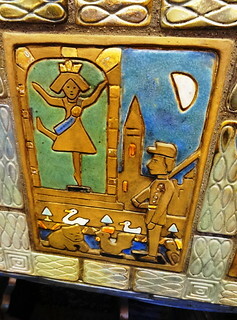 The mosaics were created by Mary Chase Stratton (Pewabic Pottery founder), Horace Caulkins and Frederick Wiley; you can see their names affixed in gold leaf at one end, Cass Gilbert’s at the other. Just being out here is amazing! 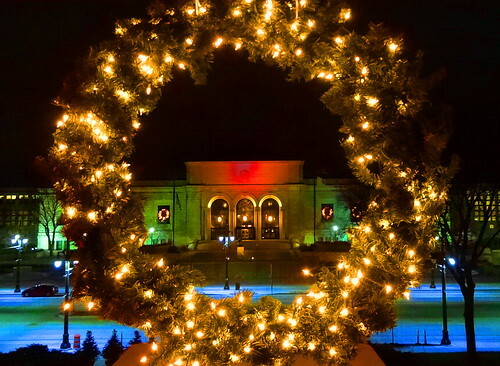 We have a picturesque view of the DIA lit in red and green for the holidays. 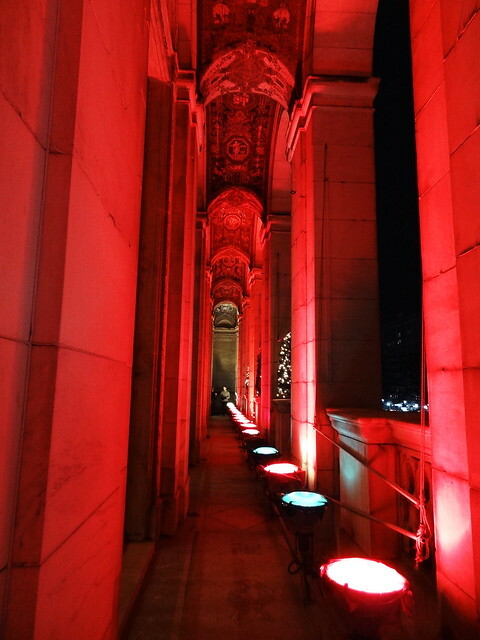 Most people don’t even know the loggia exists, it’s a special privilege to be standing outside, under the stars on a Friday night. 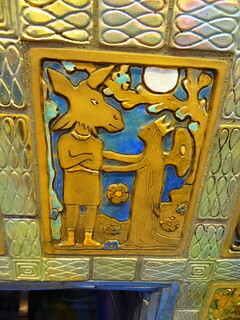 One of the volunteers has removed a colored gel from the spotlight so we can see the mosaics in their true colors–awesome. 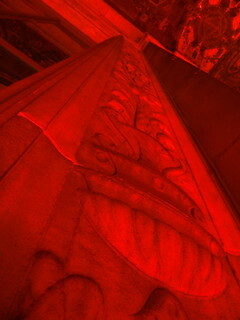 We climb back in the window; a woman sings as I stand in line for appetizers and wine. Kris ducks out into the hall for pictures, he has the floor to himself. It’s been wonderful to revisit this treasure and extra special to do the tour at night. We’re grabbing a bite to eat at The Peterboro in Detroit’s historic Chinatown. We were here for the soft opening and keep meaning to come back, tonight’s the night. 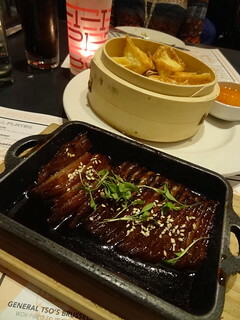 Serving contemporary Chinese American cuisine they offer both small and large plates. 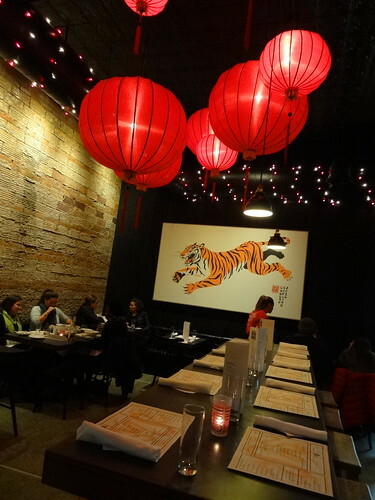 I find the space really attractive, large red lanterns cast a warm glow over the otherwise dark room, red and white lights wrap black-painted ducts, a large canvas features a fierce looking tiger. We decide on several small plates, each arrives at the table as it’s prepared. The Seaweed salad is the first to arrive, crispy quinoa and pickled mushrooms add crunch and unique flavor. The Market Veggie Rolls are nice, I like the sweet chili sauce. Mom’s Roast Pork is boneless rib tips marinated in hoisin and honey, nice flavor, odd texture. 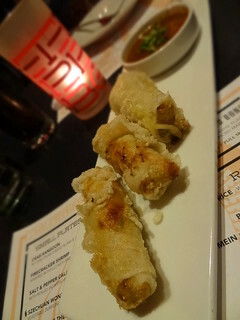 The Crab Rangoons are our favorite dish, crabmeat and cream cheese deep fried in a crunchy shell, what’s not to like?